System failure is simply not an option. Today, nobody in healthcare would question the importance of a reliable temperature monitoring system. When temperature alerting systems fail, really bad things can happen. Recently, The New York Times published an article about the freezer alarms at McLean Hospital, one of the leading research organizations for Autism in the world. During a power outage, the freezer went from – 80 C to almost room temperature. McLean lost approximately one third of the human brains that were donated because the temperature monitoring devices for that freezer failed. How can these temperature monitoring failures be avoided in the future? By using a wireless, battery-operated temperature monitoring solution that is reliable, easy to install and maintain. Easy to install and maintain: No complex wiring and the ability to leverage existing Wi-Fi networks. Ongoing maintenance and management is centralized in one location. System security: Only the temperature tags performing the readings are present, so tampering with temperature parameters would not be possible (parameters and software applications can be centralized in a secure location). Having tags that can leverage both Wi-Fi AND other RF bands is extremely valuable. If the Wi-Fi network were to ever go down or experience any other type of communication outage, the tags could still communicate with the application using an alternative RF signal. Notification Methodologies: A variety of means for notifying the user of a refrigerator or freezer problem such as e-mail, text, pager, flashing light, siren, etc. Alarm Protocols Integration: Ability to integrate your established alarm protocols with your temperature monitoring system. NIST-Certification: Depending on requirements, NIST-Certification may also be a key consideration. 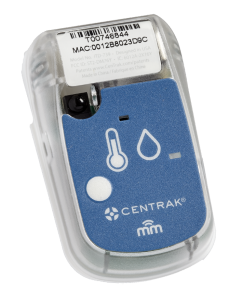 CenTrak offers a wireless monitoring solution for Temperature Monitoring as a portion of its complete solution portfolio. For more information, please contact CenTrak at sales@www.centrak.com or 800-515-2928.